Se Habla Espanol. Family Owned! With over 10 years experience, you can be sure we'll get it right the first time! We always show up on time and ready to work. We offer quick and efficient turnaround. 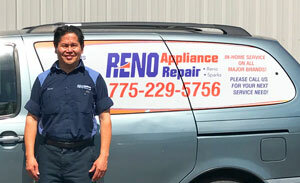 In Reno, appliance repair does not have to be expensive and time-consuming. With our years of experience, we will have your appliances up and running in no time…. affordably! We arrive at a specific agreed upon time….. who wants to waste their day waiting for the repairman? We repair ranges, washers, dryers, dishwashers, garbage disposals, refrigerators and ovens. We service Maytag, KitchenAid, Whirlpool, Amana, Samsung, Frigidaire, Kenmore, GE, LG and more! Let us be your first call for appliance repair in the Reno / Sparks area. When you call Reno Appliance Repair, you’re on your way to receiving the highest quality service in the area. We make customer service our top priority and that starts with being responsive to our customers. For questions or to setup an appointment, please visit our ‘Contact’ page to reach us via email or phone. Please use this information to contact us.